A left-handed knitter rebelling against traditionally accepted knitting notions and encouraging others to join me. Time is slippin’, slippin’, slippin’…. Well, the fun madness that was the DFW Yarn Crawl has ended and I added quite a bit more than originally intended to my stash. I had so much fun. If you are in Texas in early October next year you ought to join in and visit the wonderful shops around the Dallas-Fort Worth area. 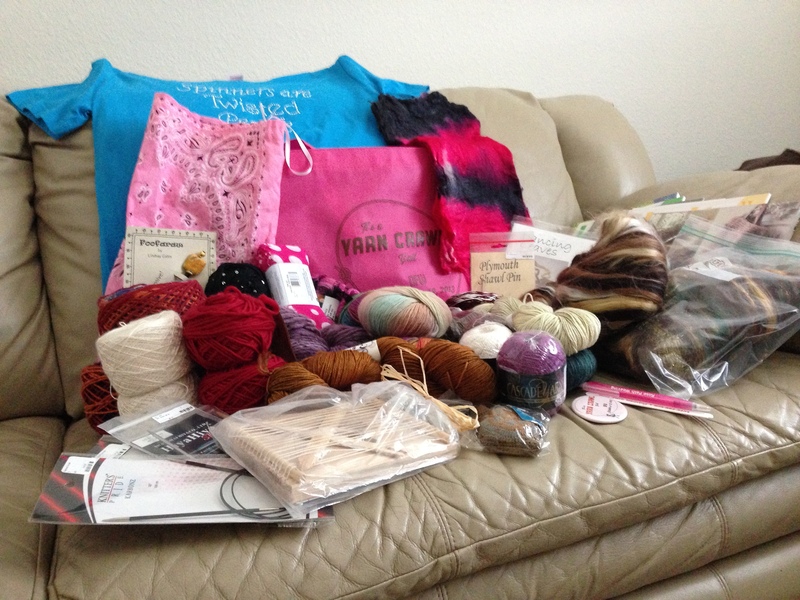 Here’s the loot I came home with from the yarn crawl. 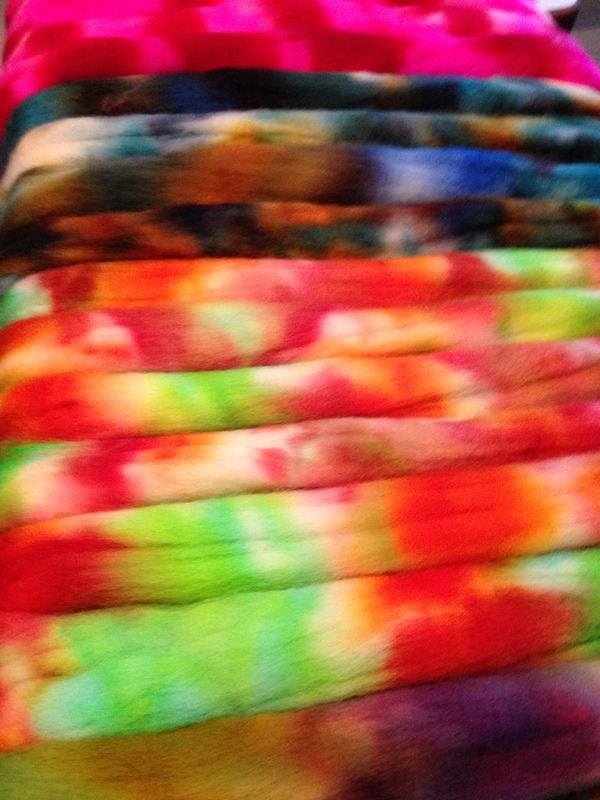 This week I have been working on dyeing for the Kid ‘N Ewe fiber best in Boerne. I have managed to get through 3 lbs of fiber so far and have another 2 lbs soaking and in planning stages for dyeing today. I’ll be adding the skeins of yarn to the dye pots next week. A sneak peek at what’s on the drying rack. To top off all of this amazingness, I finally got the yarn in and dyed for my 30 Day Sweater Challenge. I managed to get my gauge swatch knit and started on the first section of the knitting. I LOVE working with this yarn. I knew when I received it that it is one of those “petable” skeins that we like to hoard in our stash to pull out and admire and touch every so often but little did I realize that it would be just as amazing when it was being knit up. This is sheer pleasure to work on. I am so glad that I chose this for my sweater project. I tend to get bored with plain knitting and was concerned when I planned out my sweater and had hoped that my competitive nature would take over since it is a challenge. 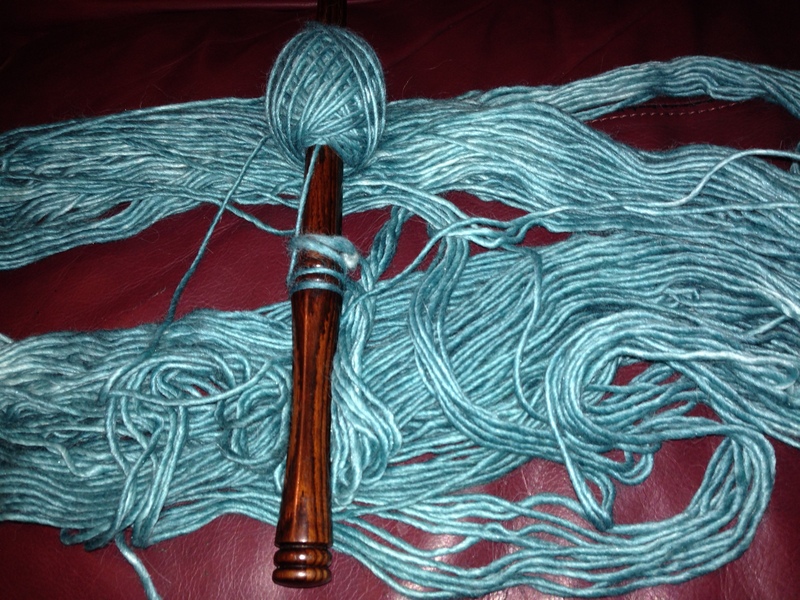 This yarn will keep me knitting just because I want to keep working with it. I’m busy knitting in every spare minute I have and hope to get caught back up to the original challenge timeline by the weekend. Well, that’s all the time I have today. Hope to get back for more fun stories and knitting updates soon. This entry was posted in Creating, General, The Barbed Dragon and tagged #30daysweater, #DFWYarnCrawlY'all, #TheBarbedDragon, dyeing, fiber, knitting, stash, The Barbed Dragon. Bookmark the permalink.